UDM Downloads > Universal Searchlet! The internet search revolution has it's name now - Universal Searchlet! Save loads of time with this astounding piece of software! Just click the icon in your systray, type what you are looking for, select the search engine and go! You will never ever have to type the URL of any search engine in your browser again. You even do not have to start the browser, Universal Searchlet does it all for you! It can be used with any website that has a search function. The possibilities are endless! Look instantly for anything at your favorite dictionary, encyclopedia, movie / music archive, search engine, auction site and zillions of other websites that you search at! Universal Searchlet will even paste it from the clipboard for you. The most AMAZING part about this program is that you can add your own searches - as many you want - and the program even remembers all the options of the search. For example, you can create an eBay Cell Phones search! 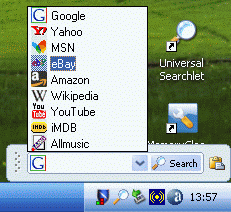 Just open the Search Engine Manager in Universal Searchlet, type www.ebay.com in the inbuilt browser, select the search field and set the option to 'Cell Phones' at the eBay website and your new search is ready to use! Now you can just click the Universal Searchlet icon in your systray, type a name of an cell phone and instantly search for it at eBay, as often as you like! Couldn't be easier. You can of course set a search hotkey: just press it, type the thing you are looking for and let it do the rest for you! Comes prepacked with dozen of searches! Check this gem out, you won't regret. Remember, time is the most valuable resource that you have. Searching the internet can be definitely fun!